Apportez votre bateau! Apportez grand-mère! Cabine accessible aux personnes handicapées au bord du lac avec quai dort 16 pour des réunions de famille mémorables! Rampe de bateau publique est à proximité, ou louer un bateau ponton, jet ski, ou un bateau de pêche de la marina et le garder sur le quai privé pendant votre séjour. Envoyez les enfants nager (utiliser l'échelle de quai incluse) ou pagayer notre canoë et 3 kayaks aux 3 chutes d'eau magnifiques du lac Glenville. En pente douce vers le lac, la grande pelouse a beaucoup d'espace pour les animaux de compagnie, ou pour les enfants de tous âges à jouer au badminton, fers à cheval, et les guimauves rôties au foyer au bord du lac. Vous aimerez prendre votre café du matin dans l'une des cinq chaises à bascule sur le pont que vous regardez le petit déjeuner des colibris à la mangeoire. Laissez les enfants jouer au maïs alors que vous faites griller des hamburgers sur le barbecue à gaz, et dînez sur le pont couvert surplombant la beauté sereine du lac et des montagnes ou, les matins frais, allumer un feu dans la cheminée à bois et profiter un bon livre ou un jeu de cartes amusant. Profitez de jouer au billard sur la table de billard en bas. Il ya beaucoup d'activités dans la région pour les enfants et les adultes: shopping, randonnée, rafting, une chute d'eau coulissante, la photographie, l'extraction de pierres précieuses, l'équitation, antiquités et plus encore. Que vous ayez envie d'action ou de paix et de tranquillité, cet endroit est fait pour vous. Accès handicapé accessible, quai privé, TVHD, animaux domestiques acceptés, fauteuil élévateur, foyer au bord du lac, gazebo avec foyer, rocking-chairs sur le porche, billard. The house was checked by my daughter and by the maid just before the guests arrived, and they assured me that it was clean. The "dirty house" consisted of dust on the ceiling fans. There were no dirty dishes. As far as the porch being not ready for guests, we pull the rocking chairs near the house so that they won't get rained on. The guests can move them wherever they like. There was a leak in a downstairs bedroom, but I was not notified of it until after the guest had left. Also, the guest left the A/C on even though there are specific instructions to leave the heat on 55 in the winter when vacating the property. She assured me she had not touched the thermostat throughout her stay even though the temperature during her visit ranged from 24 to 63 outside. This guest wanted a full refund of the cleaning fee, and was clearly miffed (and lied) when she didn't get it. From the dock to the fire pit to the deck we enjoyed every aspect of this property. It was perfect for our 3 families and fur babies. Comfortable home with ample space for all. We dined al fresco daily and enjoyed lake life and gorgeous weather. Thank you Lynda! So glad you enjoyed Leslie's Landing, Becca. You're welcome back any time. Lots of room. Private and somewhat remote (but neighbors house rented for a wedding so joyful noise one night)! Cool weather is spectacular (compared to the hot coast) and lots of waterfalls off the lake. Bring your boat for easier access to southern and eastern part of lake and restaurants or Marina. House has everything you need - feels like part of the family. Would definitely recommend for large groups and self contained fun - shop for groceries before you get there - then park the cars for the duration. Thanks, Pam! You and your family are welcome to come back any time! This home is well equipped and very comfortable for a crowd. I appreciated the "Use it and replace it" policy for the kitchen! I do agree with other reviewers that it is a very curvy mountain road (sometimes not paved) and would be difficult to navigate at night. My advice is to go and get there during daylight hours. Some sections of the roads are in the process of being repaved, but there should be no unpaved areas. Our family of 9 had a fabulous time in this comfortable house. With multiple bedrooms and bathrooms, an open and inviting living-kitchen space, plenty of storage, countertops and all the kitchen equipment one needs for a large group to cook and eat together, the house was perfect. But the lake, the dock, and the boats meant that the fun never stopped. We are sad to leave. But we will be back. Thank you Lynda!! So glad you enjoyed your stay at Leslie's Landing. We would be glad to have you back any time. 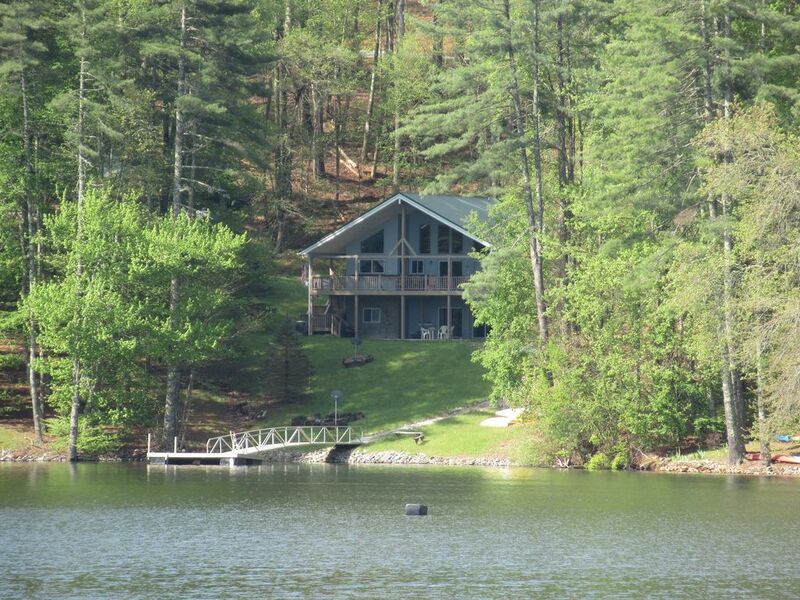 Lynda Trader's spacious, well-stocked, but unprepossessing lake house easily accommodated our three families. The location was great - an easy canoe or kayak ride to the public beach across the way was perfect for kids, as was just jumping off the dock and on to various inflatables (canoe needs new seats - we jury-rigged temporary seats with duct tape and rope). It was helpful that the main level is handicapped accessible, which the grandmother appreciated, although the shower off the main bedroom was not working. The views were terrific, especially from the dock or the main deck, the water was inviting, and the 10 of us could spread out comfortably around the house. Although there are a lot of options for hiking, whitewater rafting, etc. a short drive away, we mainly spent our time on the lake, with the exception of a jaunt to High Falls - highly recommended! The lake is not overcrowded like some other lakes in the NC mountains, and the high elevation provides a respite from the typical NC summer heat and humidity. It's the closest experience to the Adirondack lakes of our childhood that our family has found in the NC mountains. We would definitely return.